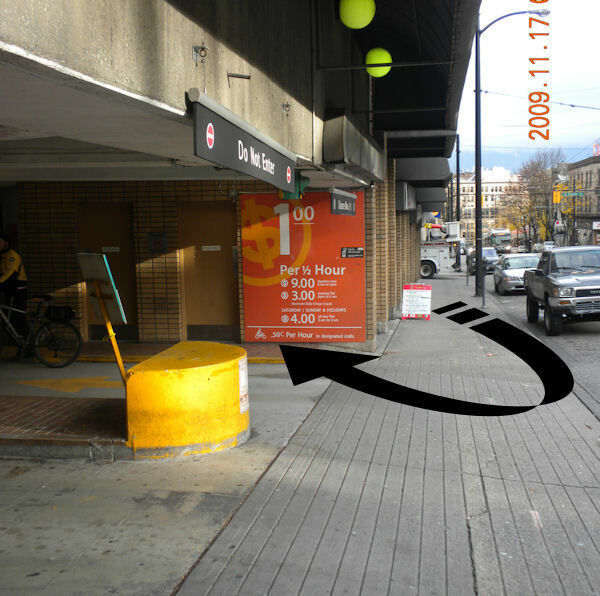 Many cyclists do cycle by this underground parking garage beside a busy, one-way street in downtown Vancouver. But the offer of secure and cheap bike parking is difficult to read even from pedestrian’s vantage, much less a cyclist riding by. Often in most areas, the North American urban streetscape is devoid of highly visible signage for secure bike parking, even if available in a permanent parking facility. Our collective consciousness is already primed not to expect, not to notice swiftly, places for secure bike parking. Instead we hope and look for the bike post, bike rack, car parking meter post or tree to lock up the bike. By the way, the rate was 50 cents per hour for secured bike parking. Helpful bike sign! Too bad it kinda gets lost there at the bottom.